Crossing the road in Portugal is a little bit more tricky than in the UK . There are lots of zebra crossings on the Portuguese roads but I have discovered that standing at the side of the road by the zebra crossing does not cause the traffic to stop. Standing on the first stripe of the zebra crossing does not cause the traffic to stop either. In fact you have to step out and start walking and then the traffic will stop, more or less!! If you stand on the side of the road waiting, you will wait all day, you have to take the risk and step out. 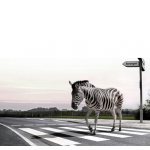 The zebra crossing experience pretty much epitomises the Portuguese health care system. There are few or none clinical academic roles within the system for medics, nurses or AHP’s and the ones that do research are the ones who just do it and step out regardless of the system and in fact there are many doctors and nurses doing research and getting published and telling people about their work even though there is no automatic pathway. It is the same at an organisational level where some hospitals are busy getting accreditation, using quality measures to build services and generally recognising the need to continuously improve despite the fact that there is no extra money or real incentive to do this. The organisations that do not step out are startling in contrast and they feel like a very bad day in the NHS circa 1980! There is definitely a streak of the latin spirit here in Portugal that is feisty and challenging despite the odds which sometimes are stacked high against them…… the cars may not stop!! However, they are making the traffic stop and they are making changes and they are doing amazing work and I know that eventually there will be a well trodden path for others to follow.